As Is transcript, Great Balloon Giveaway photos posted! You might like to have a gander at the transcript of As Is: Pop & Complicity, the closing dialogue of my solo show, Irrational Exuberance (Asst. Colors) at Sight School, featuring Glen Helfand, Patricia Maloney, and Ginger Wolfe-Suarez. The site-specific public project and social sculpture took place at the Camron-Stanford House on Lake Merritt in Oakland a few weekends ago. It was part of a series of projects sited in historic Oakland architecture called Here and Now. A closing reception for Here and Now is scheduled for tomorrow, Saturday, June 26, 8-10pm at Mills Hall, which is also the last chance to see Elaine Buckholtz’ light installation! Prior to that, catch Floor Vahn’s audio installation at Pardee Home Museum. Full details available at Mills Art Museum or Invisible Venue. Irrational Exuberance (Asst. Colors) closed today with a closing reception and an open dialogue featuring guests curator and critic Glen Helfand and artist, writer and theorist Ginger Wolfe-Suarez. Writer and curator Patricia Maloney moderated a lively discussion on topics such as optimism and pessimism, pleasure in art, the search for happiness, beauty, Kant, viewers’ experiences, discount stores, metaphorical/literal readings vs phenomenological readings, readings vs experiences, and critical versus psychological readings of the work in the show. Work by artists such as Haim Steinbach, Allan McCollum, Cary Leibowitz, Amanda Ross-Ho and Stephanie Syjuco also came up. 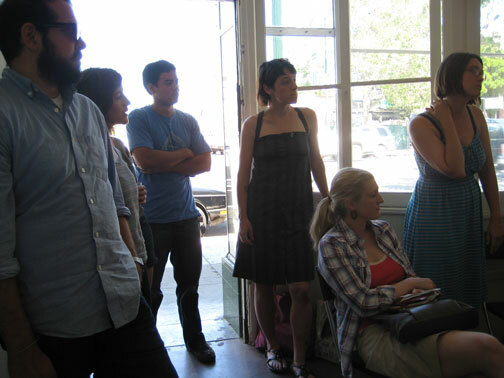 Numerous artists, critics and curators were in attendance. I was honored to help convene such thoughtful guests and attendees. Hearing their responses, reservations and speculations about my work was especially humbling. 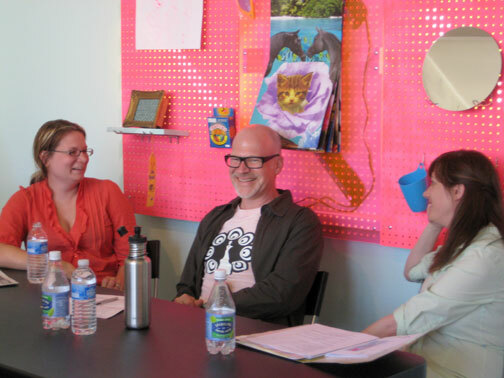 Featured guests (L-R): artist, writer and theorist Ginger Wolfe-Suarez, curator and critic Glen Helfand, and writer and curator Patricia Maloney. Vicki Gannon poses a question, as Amanda Curreri, Frank Ebert, Matthew Rana and others look on. Glen Helfand is a freelance writer, critic, curator and teacher. His writing on art, culture, design and technology, often concentrating on works by Bay Area artists, has appeared in Artforum, Art on Paper, Salon, SFGate, Wired, San Francisco Bay Guardian, and many other publications. Patricia Maloney is a curator and writer living and working in Berkeley, CA. In addition to her role as Editor-in-Chief for Art Practical, she works with the alternative exhibition space Ampersand International Arts, is a contributing writer to Artforum.com and a frequent commentator on the weekly contemporary art podcast Bad at Sports. Ginger Wolfe-Suarez is an emerging sculptor, writer, and theorist whose work has used a combination of sculpture, ephemeral events, text, and performance to negotiate shifting concepts of memory–both historical, personal, imagined, and desired. In conjunction with the closing reception for Irrational Exuberance (Asst. Colors), on view May 14 – June 12, 2010, Wed-Sat, noon-5pm and by appointment. Al’s Cafe, a diner re-imagined by Allan Ruppersberg in the 1960s in LA. To give thanks where they’re due: I first approached Michelle to do a show because I was so inspired after visiting a series of “feral events” programmed by Kim Anno and friends in empty storefronts in Berkeley. The sense of potential that incredible, urgent art experiences could happen here was an irresistible, welcome alternative to the deference given to San Francisco/commercial galleries. Thanks to Kim for the leadership and inspiration, Josh Churchill for the invitation, and Justin Limoges, Brian Barreto, Dana Hemenway, Suzanne Husky, Amanda Curreri and Michael Yap for the support, without whom Irrational Exuberance (Asst. Colors) would not have been possible.